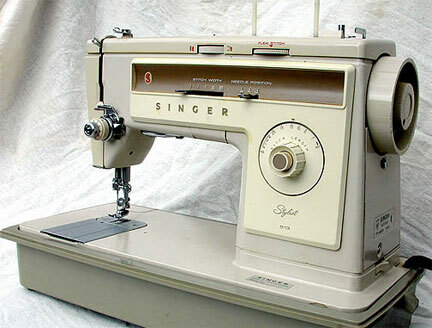 The Singer Stylist 513 sewing machine has an internal motor. It is not a true direct drive (like the Elna) as the 513 still has a belt. However, the internal belt has cogs or teeth that prevent it from slipping as the older round smooth belts were famous for. These machines have so much internal stuff moving that the belt drive was required. Just spin the hand wheel and you will feel the friction drag caused by the zig-zag and stitch width mechanisms. Some of the older machines that only sewed forward and in reverse will coast for several revolutions after the handwheel is spun, but not these babies. We don't have the manual for this machine and we have not yet figured out the two adjustment knobs on the top of the machine. This machine, SN 84341373 is a 1988 model.